Here is an immaculate presentation of six significant British cello sonatas. These represent so many diverse voices of the instrument from the autumnal nostalgic through to the lyrically romantic; from the elegiac to the defiant and the witty. All include beautiful grateful writing for the piano. 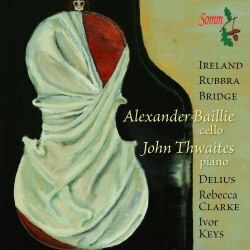 Alexander Baillie and John Thwaites are in impeccable accord with each other and with each composition - completely sensitive to every mood and style. The result of the long gestation of Frank Bridge’s cello sonata is an interesting divergence of styles. The first movement, written in the last golden glow of La belle époque, is warmly lyrical and almost extravagantly romantic, bordering on Rachmaninov-like indulgence. The second movement - Bridge only supplied two for this work - spins a deeper, more shaded, more austere melancholy. This was no doubt prompted by the carnage over the Channel and signals a change of direction in Frank Bridge’s musical path. Delius’s Cello Sonata is cast in one continuous movement and is expansively rhapsodic. Here is the voice of Delius’s longing - tinged with a nostalgia for people and places beyond reach? Baillie and Thwaites work well together, eloquently phrasing and implicitly controlling this seamless expressive span and forging it into heartfelt music of haunting beauty. John Ireland’s Cello Sonata carries in it the strong influences of Debussy and Ravel and elements of so many works associated with his beloved Sussex. I can hear, for instance, echoes of Amberley Wild Brooks (1921) and a pre-echo of the Piano Concerto (1930), associated with Chanctonbury Ring that overlooked his final home, Rock Mill. This can be found in both the outer movements that show a certain Stravinsky-ian influence and in the lovely slow movement; listen to the piano’s exquisite opening of the slow movement. In her Sonata, Rebecca Clarke’s strong voice declaims bacchanalian delights and a softer, dreamy sense of languid, sensual love. There is a similarity of expression between Rebecca Clarke and John Ireland - influences of Debussy and Ravel - especially in the impish Scherzo - are apparent in this delightful, approachable, melodic sonata. An unusually extended third movement is contemplative, perhaps for what might have been before the return of the bacchanalian mood. The entwined writing for cello and piano is inspired. How well I remember Ivor Keys when he was in Nottingham. My first wife often sang soprano under him when he conducted the Nottingham Bach Choir. His Cello Sonata is virile and resolute with a somewhat detached lyricism. The more serene second movement proceeds in almost prayer-like contemplation and exploits the cello’s singing tone while the slightly sardonic third movement, as a theme and variations, has a rather waggish character. Rubbra’s Cello Sonata in G minor places its emphasis on classical counterpoint, “redolent of Bachian invention” as Jeremy Dibble aptly comments in his learned notes. Yet it has, too, a more modern romantic seam and that lyrical material proves to be triumphant. The Vivace flessible central movement moves forward energetically and triumphantly. The extended third movement is a rather sombre set of variations, again with the Bachian influence strongly apparent. The movement reaches a more positive if rather enigmatic conclusion. Six significant British cello sonatas impeccably performed.